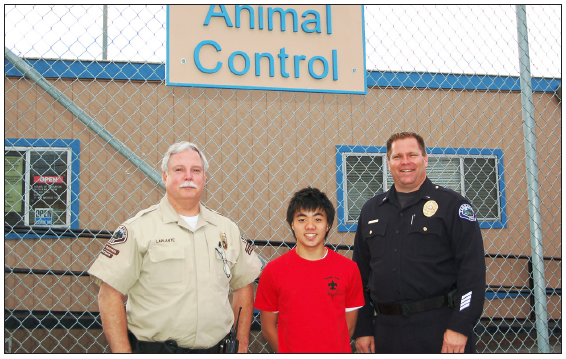 For his Eagle Scout project, Kyle Nishimura renovated the Torrance Animal Control Center at Wilson Park in Torrance. TORRANCE — Kyle Nishimura, 16, a junior at South High School in Torrance, has earned the highest advancement award the Boy Scouts of America offers to Scouts, the Eagle Scout Award. Nishimura will be recognized in a Court of Honor ceremony on Saturday, July 5, at Riviera United Methodist Church in Redondo Beach. A member of Troop 586, Nishimura is one of approximately 5 percent of all Boy Scouts who attain the Eagle rank, according to Scoutmaster Jon Frey. Nishimura’s Eagle project was to renovate the Torrance Animal Control Center at Wilson Park in Torrance by painting the structures, cleaning the outside of the facility and adding two signs to increase visibility and awareness. Nishimura is a member of the South High varsity track team and Kiwanis service club, where he is a divisional officer and a school officer. He has been a summer camp counselor for children with special needs at Camp Escapades, through Pediatric Therapy Network, for the past five years. In 2010, he was invited by American Honda to ride on its float in the 121st Rose Parade, “A Ship of Dreams.” He was one of the youth that represented volunteerism. This summer, Nishimura will be representing Torrance as a student cultural ambassador through the Torrance Sister City Association, traveling to Kashiwa, Japan. He is the son of Scott and Terri Nishimura of Torrance.